Ethiopian ambassador to Egypt Taye Stke-Selassie Amde had just come back from a visit to the Egyptian foreign ministry when he spoke to Al-Ahram Weekly, adding that he had had discussions with the Egyptian authorities on the possible dates of a visit by Ethiopian Prime Minister Hailemariam Desalegn to Cairo. The visit, Amde said, would be “in December”. However, earlier this week, Egyptian Foreign Minister Sameh Shoukry said it would be in January and after a visit he was planning to the Ethiopian capital Addis Ababa to meet his Ethiopian counterpart and the country’s prime minister. Amde had not sounded very convincing about the date of the possible visit. He said it should happen when the atmosphere was “positive enough” to allow for an overdue meeting of the joint Egyptian-Ethiopian Higher Committee on the building of the Grand Ethiopian Renaissance Dam (GERD) that should have taken place last year in Egypt. The first round of the Committee meetings took place in Addis Ababa two years earlier. 2017 cannot be described as a year of positive movement in the negotiations, essentially between Egypt and Ethiopia, over the impact of the Dam that Addis Ababa is building on the Blue Nile. This provides Egypt with over 80 per cent of its annual share of Nile water, with this already falling far short of its needs. Amde acknowledged that there had been ups and downs in the negotiations, which also include Sudan, in the process launched in the Sudanese capital in 2015 under the title of the Khartoum Declaration of Principles (KDP). In that Declaration Egypt acknowledged the right of Ethiopia to build the Dam in return for undertakings related to its safety and the water rights of downstream states like Egypt and Sudan. However, he said the negotiations under the KDP were not the only reason for the delay in the meeting of the Joint Higher Committee. The delay was the result of tensions in bilateral relations that were not just about the GERD, but also about the attitude of the Egyptian media to Cairo-Addis ties, he said. The KDP is supposed to allow Ethiopia, the upstream country of the Nile, to discuss with Egypt and Sudan, the two downstream countries, its plans to continue the construction and then to start filling the reservoir of the GERD, which it started building in 2010 without agreement from Egypt. Egypt, according to the official narrative, was not happy to see Ethiopia expanding the capacity of the GERD reservoir from 14 billion cubic metres of water, as was originally announced, to 74 billion cubic metres. However, according to the same official narrative, Cairo chose to act in good faith in the hope of reaching an agreement that would accommodate the development aspirations of Ethiopia and its own water-shortage worries. Sudan, with much larger water resources than Egypt, does not share the worry over a drop in its annual share of water from the Blue Nile. However, it still needs, at least in theory, reassurance on the safety of the GERD, since if this were to crack or even collapse the resulting floods could inundate Khartoum. The objective of the negotiations thus far has been to grant Egypt and Sudan, which have not denied their differences within the process, reassurances on the safety of the Dam and on plans to fill the reservoir in a way that will not cause harm to Egypt’s water rights in accordance with prior agreements. Over the past two years, especially 2017, there have been hardly any positive messages from the Egyptian delegation. Both the political and technical teams working on the Dam have shared growing scepticism about what they found to be a “lack of commitment on the side of the Ethiopian delegation” with regard to a clear plan for the filling of the reservoir or a transparent sharing of information on the safety of the body of the Dam. “No one wants to go into uncharted territory,” Amde said. “And nobody said the process has died… there is a meeting scheduled to take place in Khartoum” in a few weeks’ time, for example, he added. Amde sounded confident that the possible meeting between Egyptian president Abdel-Fattah al-Sisi and Desalegn could help things to move on. However, he insisted that it was the job of the technical teams to come up with ideas rather than to throw the ball into the court of the political leadership. He denied accusations coming from government bodies in Cairo to the effect that Ethiopia is simply “playing games and trying to buy time” while it continues its construction of the GERD. He insisted during a 40-minute interview with the Weekly that it was not at all the intention of Ethiopia to cause harm to Egypt’s water interests, especially since the water that would be amassed in the GERD reservoir would be used to generate electricity rather than for agricultural purposes. As for the questions of whether Ethiopia would start filling the reservoir without a conclusive agreement with Cairo and how many cubic metres of water would be subtracted from Egypt’s annual share, Amde said only that these were matters for the technical teams to discuss. He insisted that the Egyptian announcement of the failure of the talks was not about the reluctance of his country’s delegation to negotiate in good faith, but was rather about a disagreement over technical elements of the report presented by a consultancy firm on the construction of the Dam. 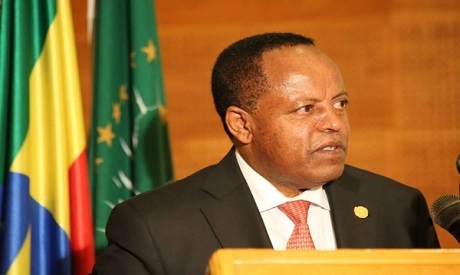 Today, ahead of an anticipated visit by his prime minister, the ambassador of Ethiopia said that technical experts on both sides should be able to find ideas to share with the political leaders in order to help them give a positive push to the negotiations whose success was in the interest of all parties. He acknowledged some technical disagreements, including the interpretation of “current uses” of water and how to assess possible averages for the annual use of the downstream countries, Egypt and Sudan, to allow for the fair definition of a baseline. Meanwhile, he would not acknowledge the complaints made by Egyptian official quarters about the “reluctance” of Ethiopia to commit to a Nile water-sharing agreement signed in 1959. He argued that Addis Ababa was not obliged to commit to this agreement, to which it was not a party. Nor, he added, was Ethiopia required by the KDP to acknowledge it. Amde suggested that this was an essential part of his talks with Egyptian officials while examining the preparations for the possible visit of the Ethiopian prime minister to Egypt. However, he was not willing to hide his blame for what he called the “negative narratives” that some in the Egyptian media had been offering about the path of the negotiations so far. For the most part, commentators have been sharing their concerns about the true commitment of Ethiopia to reciprocate Egypt’s accommodation of Ethiopia’s desire to build the GERD to provide it with electricity with a commitment to work out a way that will not mean the Dam’s having a devastating effect on Egypt’s already insufficient agricultural land and water share per person. Some commentators have argued that the time has come for the talks to be suspended and for the Egyptian authorities to pursue legal means to secure the compliance of Ethiopia to Egypt’s rights as a downstream Nile Basin country. For Amde, this kind of discourse does not help pave the way to successful cooperation between the two countries on their matters of disagreement. He said that for a successful outcome of the anticipated talks between al-Sisi and Desalegn to be guaranteed, there needed to be less tension in the air. He said that the Ethiopian authorities “were not happy last year” with the expected date of the second round of the joint Egyptian-Ethiopian Higher Committee and the line taken in the Egyptian media and “thought it wise to postpone” the meeting. That said, he insisted that the meeting would convene this year. He also insisted that the two leaders would be able to send a positive message to dispel concerns in Egyptian public opinion and to reassure Egyptians that Ethiopia would never act in such a way as to harm Egypt. They would also attend to the concerns of Ethiopian public opinion, he said. “This process shouldn’t be driven by emotions or by combat diplomacy. With serenity, we can bring about a solution,” he said. Amde said that he was expecting the joint Egyptian-Ethiopian Higher Committee to discuss matters of common concern to the two countries that go beyond the GERD to the benefit of both. *This story was first published in Al-Ahram Weekly.